What a great privilege to get news from a satisfied customer! That’s why I decided to publish some of their letters here. These comments have a high value for me, they are often very emotional and touching and I can’t thank my clients enough for their precious words and positive feedbacks. It’s stimulating to know that I can make people happy with my art, this makes me love my job even more! Most of my portrait commissions were made for pets that are unfortunately gone. I truly understand what it means to be parted from them and the great emptiness they leave in our lives. My painted stone is amazing, I will be buying more animal rocks from you as the detail of the painting is so detailed and it looks lovely sitting on my bedside table, thank you very much! I received my items in the mail with a hand-written, personalized note from the shop owner. The earrings are amazingly beautiful. I bought a pair for my soon-to-be mother-in-law and another pair for my fiancée. I will certainly buy from this shop again. Thank you! Hi Roberto, I wanted to tell you that we got the rock for Sabrina today. It is absolutely perfect. 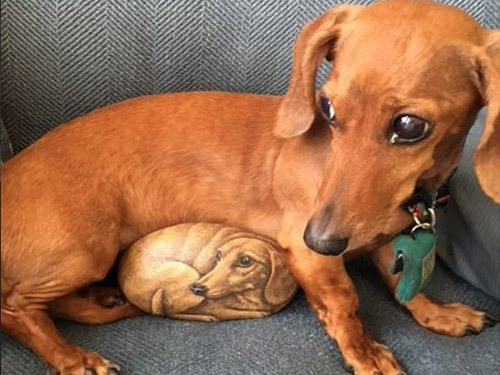 It looks so much like her, it made us cry. You do beautiful work. We look forward to getting the others. Thank you so much! Lovely cat painting on pebble sent direct to my friend in USA for her birthday. She absolutely loved it, thank you Roberto! Hi Roberto, I received the beautiful portrait today. Thank you so much! I love it and can't wait to give it to my husband for Christmas. He loves that cat so much, he's 18 years old. When he is gone, my husband will have this to cherish. You did an excellent work, I simply love it! Thank you very much Roberto! Received my cat portrait today and looks even better on my bookcase than on your website. Absolutely beautiful. Thank you! I love my custom cat rock! I ordered for a friend who recently lost her beloved cat. I can’t wait to give her her rock! Absolutely gorgeous. 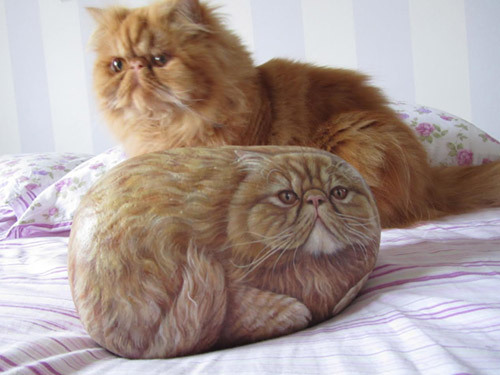 I ordered a painted stone for my kitty Nell. 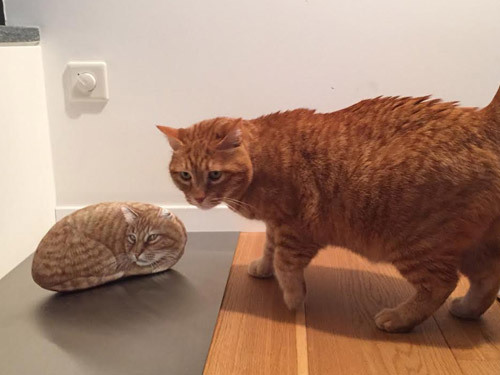 The rock portrait is really identical to my cat's picture. When I got it at home I was so amazed to see that the rock looked so much like Nell! And the expression of her eyes is really who she is. Again, I did not expect to get such a wonderful result when I ordered this portrait. Roberto is such an amazing artist! I can't say more than: go for it! I live in Canada and Roberto in Europe. We did everything online and the payment was really secured and I encountered no problem all along the process. We have two cats: Nell and Peps. The result for Peps is as wonderful as the one we got for Nell. So, go and order yours! What can I say about perfection? I ordered the penguin and baby. The shape of the stone was perfect. The painting is really moving. His animals are all gorgeous. You can't go wrong. You will be as happy as I am with my rock painted penguins. I hanged this piece on a side wall next to my working table. Can't stop looking at this awesomeness. If I don't look it catches my eye anyway. Very cozy piece of art! Roberto, your items are beautifully detailed, alive like. Thank you for the love you put in, it's seeping out of your art. Dear Roberto, we are very happy with the portrait you painted of our beloved Elvis. You really caught his soul in your painting. Thank you so very much. You made us both cry. We cannot wait for Elvis to come home. This guy is simply amazing...I bought one painted rock from him and the details blow your mind away and it is not only painted in the front but also the back! Roberto not only capture the beauty of the animals, but also the soul in their eyes!! Highly recommend him. Thank you! Simply beautiful! Masterfully painted. I will treasure this painted cat for a lifetime. I was very happy to receive my cat painting. I really appreciated the note that you sent. You are a talented artist and I am honored to have your work in my home. We are so excited...when my mom saw Casper's rock portrait she was touched and remained to admire it for hours! She says you have golden hands! Thank you, you made her wish come true! The portrait of my beloved Asia is simply amazing, it gives me strength and a huge emotion. You are a great and excellent professionist, all the care and love you put in your paintings differentiate you from many other artists. Thank you very much, Roberto. I'm so happy that Roberto found unique stones to paint my betta fish and a gorgeous macaw. I'm looking forward to ordering more from this talented artist. Thank you so much! Hi, Roberto! I received your exquisite artwork today. I am so happy, so excited, so proud to be the holder of this great piece you created. It's even more stunning and lifelike looking in person. I have placed it on my fireplace mantel, as it is an excellent viewing spot and one of my female Bengals, Savannah, likes to frequent. I would especially like to thank you too, for the care in which you took to prepare and wrap this piece for shipping...excellent job! I wish you and your family a very Merry Christmas and a happy, healthy, and prosperous New Year...you've certainly made mine! This is a wonderful addition to my art collection. We love our little Nutmeg (miniature dachshund) and Roberto did a wonderful job of capturing her cute little face. The package arrived on time and well protected. We will enjoy his creation for years and years. Thank you. These two barn owls are painted so perfectly! Now I have two gorgeous little pieces of art as earrings and I am very happy with them. Thank you Roberto! Great seller, artworks well packaged, fast shipping, items as described, thank you very much. Five stars! What a beautiful painted stone! I have two black cats named Salem and Sabrina. Black cats are my favorite and I love this painted stone! I have it displayed with my cats photos. Thank you so much! I highly recommend this extremely talented artist and wonderful website. It was a very pleasant experience and I will be back to shop with you again. I'm a very happy customer. Bravo! OMG, it is so beautiful and perfect craftsmanship. I can feel a new addiction coming on. I just love it! A beautifully painted pet rock portrait by the very talented Roberto! The fine detail just captures the soul and essence of my beloved cat Bacchus! Everyone who has seen the rock is amazed by the likeness of the portrait to my sister's cat! Highly recommended artist! Perfect item and packaging, fast shipping, gorgeous pet portrait, kind seller! Highly recommended. Even though the photos are phenomenal, seeing these stunning earrings in person is incredible. Lovingly painted with exquisite details. I'm so pleased to have found this artist and his fabulous creations. Perfect transaction from start to finish; great packing too. Arrived safely in Nevada all the way from Spain. Thank you!!! I lost a treasured friend, my beloved Gizmo, 3 years ago. My little dog used to lay his gentle head in my lap and shared his silent thoughts with me. Gizmo will no longer come to my call, or retrieve his favorite ball. Although my eyes are filled with tears, I am thankful that I had him for 6 years, and for his love and loyalty. I asked Roberto to make a portrait and a painted rock in memory of him, I received the package yesterday and was in awe of his tremendous artwork! I now have Gizmo forever immortalized in my canvas and stone, I'll be forever greatful to you! Hi Roberto, once again I’d like to thank you for the most beautiful work of art you did on the stones for Niccolo’s FHC. They are absolutely awesome and so professionally done, you are really very gifted. Niccolò and I still have a few days left to decide which one to keeps as we love them all...warm regards. I got this as a Christmas present for my wife. She loved it! The workmanship, attention to detail, everything was amazing! I am throughly impressed with Roberto's work! I recommend him to anyone looking for a beautiful, one of a kind gift idea. It was worth the wait for overseas shipping. Try him out and you won't be disappointed! Absolutely stunning! Gorgeous item, very talented artist. Arrived all the way to Dubai safety. This seller provided a great service. I also ordered a necklace for my Nan, she too loved it and said it was gorgeous. Thanks again for all your help. This is a great portrait of my beloved Milo! I would now love to order a small painted rock so I can carry it around with me! Roberto is a true genius with such an amazing talent! 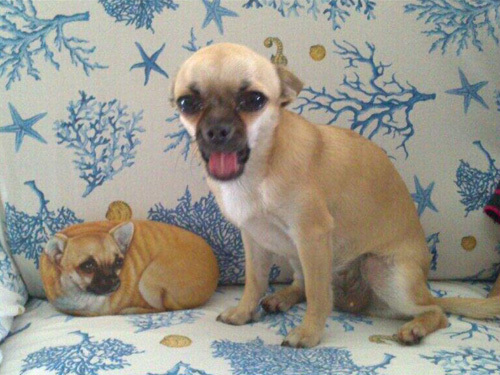 Hello Roberto, I've just received the painting of Dime and it is absolutely stunning. I cried when I saw it, you have captured him to perfection. Roberto, your talent is second to none. I could not have asked for it to be any better, what an amazing painter. You have so much talent. I cannot thank you enough for putting all your love, time and energy into this wonderful portrait. All of my friends have been amazed at your talent. They are spell bound over your perfection to capture Dime's true spirit. A Masterpiece. Thank you so much once again and God bless you. Hello Roberto. I actually needed a few moments to collect myself after receiving my portrait. I am completely, completely blown away and speechless: it is so incredible and amazing. I probably cried for 30 minutes. You did such a beautiful job, I can’t even believe it. It’s almost like looking at his face again. I will treasure this forever, THANK YOU SO SO SO MUCH. I cannot say enough about Roberto's art.....this is the most amazing piece of art EVER.......I absolutely LOVE, LOVE, LOVE this hand painted rock.....the likeness of my puppy is unmatched! UNBELIEVABLE! Roberto deserves 1,000,000 stars! Roberto did my custom cats portrait from a compilation of several photos. I can’t say enough about how he captured their hearts, souls and personalities. 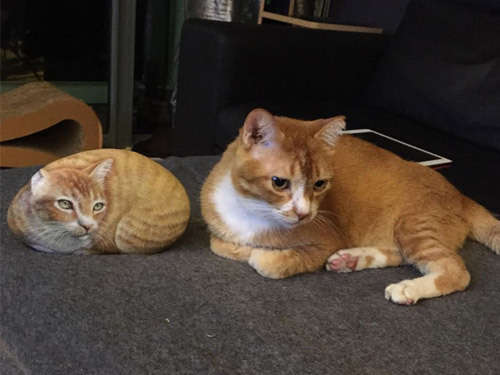 They were brothers and we lost my beloved Skitter earlier this year and having this beautiful piece will bring smiles to our faces forever. The portrait was packed and shipped perfectly and arrived in Minnesota in a timely manner. This is the second piece I’ve gotten from Roberto, his talent and compassion show in each piece. I highly recommend viewing his works or contacting him for something custom made. You will not be disappointed. I can't tell you how happy I was when I opened up my gift to myself. I absolutely LOVE my owl! It's beautiful, incredibly detailed, a true work of art! I also appreciated the handwritten thank you note. If you want an incredibly detailed handpainted item, Roberto Rizzo is a master at his craft! I'm in love! My rock painted owl is spectacularly beautiful! Roberto captured the eyes and the beauty of an owl on a stone. He sent it immediately and delivered with it a hand-written note. I am going to definitely order more from him. What a unique talent! This artist is amazing! Communication was fast, courteous and clear. Roberto should be THE only artist to consider if you are seeking a pet portrait that really captures the spirit and subtle expressions of your pet. We sent five or six photos of our cat and within less than a month, our package had arrived at our home in the USA from Spain and the work is stunning. I would buy again instantly! Thank you Roberto!